Flying in foggy conditions and below-freezing temperatures, Nick Morrison piloted an unmanned aerial vehicle that inspected an industrial flare field one recent winter day on the North Slope. The mission was to inspect the flare field for visual and physical damage. Morrison’s flight partner, Ryan Marlow, operated an infrared sensor mounted to the unmanned aerial vehicle (UAV) to detect temperature variances. The sensor checked for any loss of insulation on the pipeline. A normal scenario would have involved shutting down the flare field for safety and bringing in a helicopter, which can cost potentially millions of dollars in lost revenue and last several days on average, Marlow said. But now the new norm is having drones perform the work. Thanks to rapid advancements in UAV technology, these flying computers are on track to take the construction industry by storm. “It’s been an evolution over the last couple of years,” Marlow said. Rather than shutting down systems such as active flare fields, AAM can remotely fly an unmanned aircraft into a hazardous environment and use topof- the-line sensors to record data. Yes, AAM could potentially damage or even lose its pricey UAV due to some unforeseen circumstance, but at least there would be no loss or risk to human life. Marlow was able to fly the UAV over the top of that flare field — an action helicopters are prohibited from doing — and scan the facility to capture data. “By using our systems and sensors our client was able to realize savings in the millions of dollars while reducing risk,” he said. AAM’s flare field inspection job is Marlow’s favorite success so far in the company’s short history of working in the construction industry. 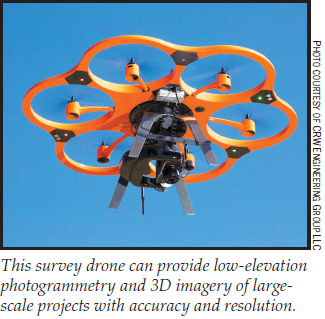 It was the first time Lidar surveying from a UAV had ever been used in Alaska, Marlow said, a tremendous feat compared with four years ago when AAM began its Anchorage-based business by flying drones for real estate and cinematography work. Within the past two years, AAM started to see a saturation of drone companies entering the motion picture industry, as well as better technology in survey-grade equipment. At that time, AAM was aware of the Federal Aviation Administration’s drafting of Part 107, which is now law and outlines rules and regulations for commercially operating small unmanned aircraft. Part 107 requires no hands-on experience flying an aircraft, whereas the Section 333 Exemption required all UAV pilots to have a private pilot’s license. 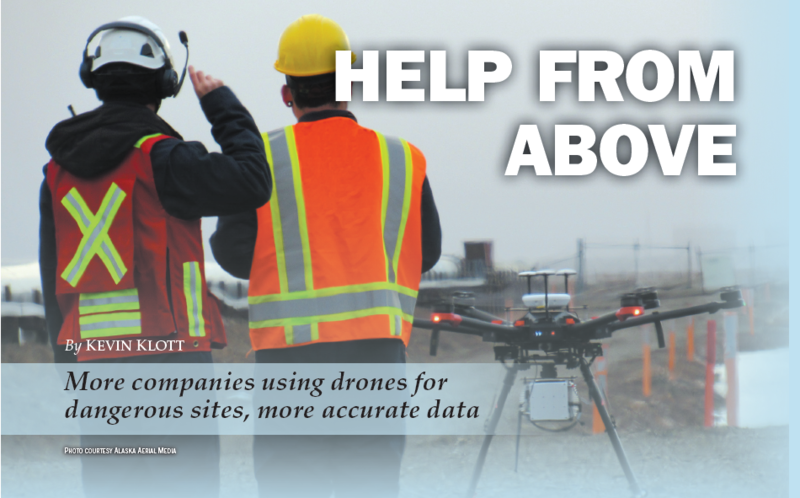 AAM started small by assisting local survey and engineering companies — and proving these technologies and workflows — with the goal of allowing data from a drone to be used more than traditional data. Marlow said proving the data was accurate was the most challenging part because it had never been done before. CRW Engineering Group LLC purchased its first survey drone a year ago, and the company saw immediate savings. “One project took us two days to collect the data where it would have taken two weeks (with the old system),” said Mike Jokela, a principal and survey manager who has worked at CRW Engineering for 12 years. With conventional methods, surveyors would walk an area and take shots at each point with a GPS device or total station. 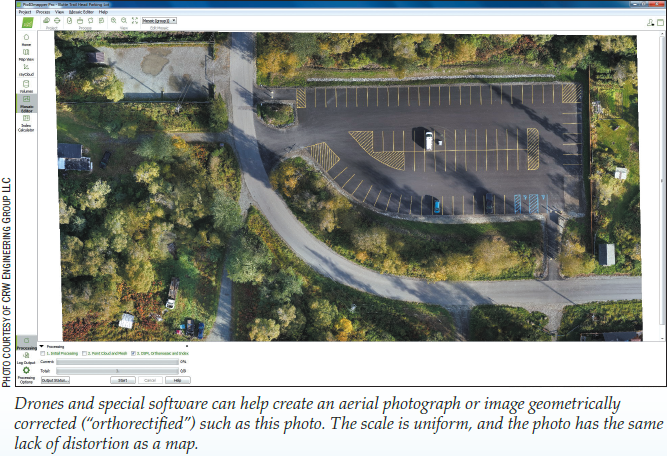 A drone can fly the same route, photograph the route, do it in less time and computer software creates a 3D model of the roadway with all its improvements. “We can extract all that data with very little field surveying,” Jokela said. A drone provides a data point every centimeter. If a surveyor was surveying the field on foot, they would be collecting every 10 feet or so. Another advantage of using a drone is its ability to provide orthorectified imagery, which is basically a photographic map. When a surveyor measures something on the photo, it’s accurate, Jokela said. There’s no distortion at all from one side to the other. All that accuracy is translating into more business. “We’re getting projects we typically haven’t gotten before,” Jokela said. When he began his surveying career 36 years ago, survey tape, also known as a chain, was his main tool to measure distances. Chains were eventually replaced by EDMs (electronic distance measurement) and total stations, which measure distances using laser technology. GPS devices replaced lasers, and now drones are replacing the GPS. The Alaska Department of Transportation & Public Facilities also considers unmanned aircraft a valuable tool for its operations. Troy LaRue, Division Operations Manager for Statewide Aviation, said the department is creating a drone program. Its best example of success involves avalanche-control monitoring. Some DOT&PF employees are licensed to shoot howitzers and bring down snow accumulation alongside highways such as the Richardson Highway near Thompson Pass. Thanks to photo imagery and Lidar, DOT&PF can gather data about the terrain and snowpack before shots are fired into the snow. Currently, DOT&PF can only guess where the highest snow loads are located. “Accurate data is hard to come by,” LaRue said. It’s also difficult to gather accurate information about unmanned aircraft rules, regulations and standard operating procedures. That’s why Alaska Aerial Media created a sister company called Advanced Aerial Education, which offers programs that not only prepare private and government organizations for the Part 107 test but also properly train future pilots how to fly and manage the complexities of unmanned systems.